um i dont know what i did rong last time..
What is your previous experience in any type of moderation? - I have been staff of servers before, I have come across situations of griefs and robbed players and have solved it. What skills do you have? We are always looking out for talented users. (Are you an Artist, Builder, Graphic Designer, Programmer etc. If you have any work please submit a link so we can check it out!) - I am quite good at building, I love drawing lot's and have one art competitions in the past, and I am indeed a graphic designer! What is your previous experience in any type of moderation? - I am Co Owner on my friend Russell's (russelluhl) server. What advice would you give to someone that has been griefed? How would you help? - I would help rebuild and co inspect and see who did it. Anything else we should know? - I'm really nice, I like to help people, and I like peanut butter. What time are you most often on? (your time) - Around 4:00Pm But its soon summer so I might be able to get on more often! Are you multilingual (Speak more than one language)? - I can speak English and Gaelic (Irish). What advice would you give to someone that has been griefed? How would you help? - Well first do not panic, first ask lower staff to report to bigger staff witch would help to problem, or help rebuild that has been lost. Good and bad English count? I'm pretty good at decrypting text speak. I think it's been over a year now. I play for a few hours a day lately. Owned my own server. I also moderated on roleplaying forums. 1-3 or more, unless it's a rough work day then maybe 1 at the most, if any. "Calm down, everything will be fine. Remember, this is a game, even if you put a lot of time into it. I'll help you gather materials and rebuild (or roll it back if it's possible)." After that I would find and punish the griefer as per rules and procedure. I'd also do what I can to help the member rebuild (if there is no roll back option) and adopt a more positive outlook. I have a gaming youtube channel and I have promoted servers before (dead servers, by the way). It is currently listed as my website if you wish to check it out. I was considering a video for my friend's town, anyway. Other than video creation, not much. I can build but nothing too impressive. I can play with graphics, but it's nothing too good. I'm terrible at art and have never touched programing. I can, however, write and create interesting story concepts if you ever wanted to do something special for roleplayers. Although I am an adult with a life and family outside of the internet, I will do my best to be around more and more over the coming weeks (I've actually broken my personal record with how long I've been on the last two nights). I have a born desire to help people, and get an odd sense of life satisfaction from it. Where are you most active on the server? (Town Building/minigames/pvp/etc) - I Love to build if im not building im survival mining I do this on both Towny and Pvp. What advice would you give to someone that has been griefed? How would you help? - Ask them what has happened and if they know who has griefed, check the grief area with GriefLog (if the server has it). Record the user (multiple times) and submit a report to higher rank (if minimod doesn't have the commands to act upon this rule breaker). Are you able to record? (Or help Promote Server in different ways?) - Yes, I have Twitch Youtube and a Anime&Cosplay/Gaming page on facebook which I regularly post on about the server I'm playing on. What skills do you have? We are always looking out for talented users. (Are you an Artist, Builder, Graphic Designer, Programmer etc. If you have any work please submit a link so we can check it out!) - I consider myself an Artistic Builder I simply love building (and showing off xD). Hello you may know me as GoudaorCheddar, others know me as Simon. I have been on this server for about a year, a little more than that, it was at 1.5. I was looking on a server list and I found this server. I thought it was going to be a bad, like one of those misleading servers that say they are something but turn out to be bad. Well I stayed on the server for 10 minutes, which means it was good. I made a town and I invited my friends to the town. It grew to about 10 people. It was beautiful and I was surprised I could make this look like a real town. The there was an update. I look for a nice looking town and the I found the one, “Sky Pyramid”. I became a member of the town and soon a Vip. I made a new friend in that town who is one of my close friends today. We had adventures everywhere. The one day I got an opportunity to become staff on a server, so I left. I became a mod and advanced up the ranks to admin.I helped the server in many ways, helped the players, I built buildings ect. Then the server Owner wasn’t as active as he used to be, he sold the server to someone else and the server fell apart. I came in contact with my friend again and we started playing on Village Craft again. We mainly went from town to town to help players. Then we found the perfect town that had 20-30 players. We helped grow the town into a strong popular town called “Haven” which now has about 720 and is still growing. I have made more friends in this town, even best friends. We invited players that did not have a town and need one. We helped new players learn the server instead of leaving first thing they join. I helped solve grief problems and made homes for players. Taught them the rules and helped them make friends and love the server the way I did and still do. 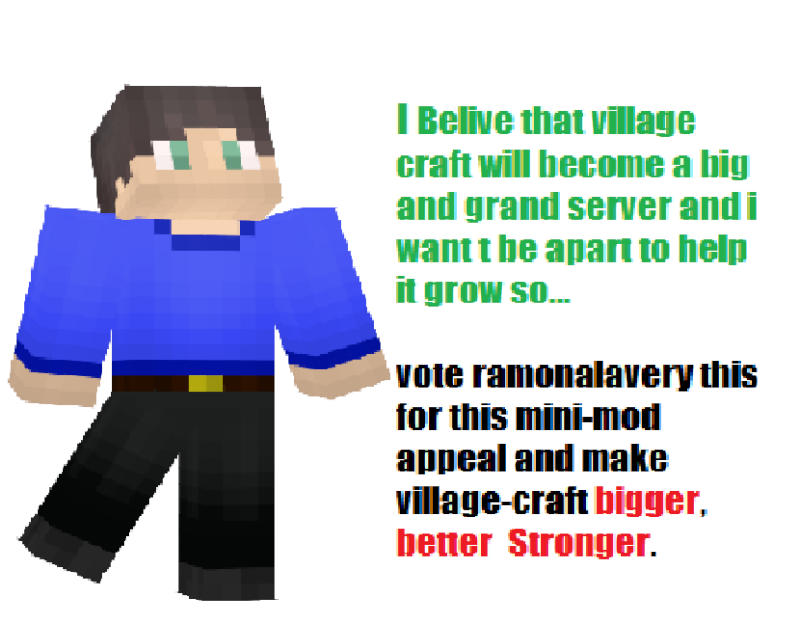 I want to join the server now as a mini-mod and help even more players with greif, building finding towns and friends. Showing rules ect. I want to do the same as I did on the other server I was on and help it grow into a larger server. I want to help build the server new structures and buildings. Help with problems and entertain the players to enjoy the server.I want them enjoy the server the same way I did and I still do. Age - 12 going on 13 on July 2nd. What time are you most often on? (your time) - when I wake up so 12 or 1 to 12. When did you first play Minecraft, how often do you play? - about a year and a quarter ago, I play almost all my day (since it is summer). Where are you most active on the server? (Town Building/minigames/pvp/etc) - Town Building and sometimes VTA. How many hours can you contribute per day? (As long as your can log into the server 3 or more times a week for a hour or more) - 4-5 hours everyday. What advice would you give to someone that has been griefed? How would you help? - I would first co-inspect, then depending on how bad the grief jail/ban/temp ban, get someone with roll back or help rebuild myself, then give the player items that they lost,I would then tell the player to lock their chests with and if they have a town tell them to claim the land or make a town to claim the land, then report to higher staff to make sure. Are you able to record? (Or help Promote Server in different ways?) - Yes once I get my new computer, I can also advertise on my instagram. What skills do you have? We are always looking out for talented users. (Are you an Artist, Builder, Graphic Designer, Programmer etc. If you have any work please submit a link so we can check it out!) - I like to draw and paint but I need more practice, I am an amazing builder (or thats what my friends say), I think I need to learn more designs and different styles of buildings to become better, I hope to use my "talents" on the server, I am also good at math-I was the second highest in my grade. I am going to learn to code/program. Now That you have read Everything I have to say, I can’t wait for the voting to start. Hopefully with my luck, I can pass the top 10 and become a mini-mod and bring my building skills to the server and help others. I wish luck to everyone else who is competing in this election. Best to all of you! 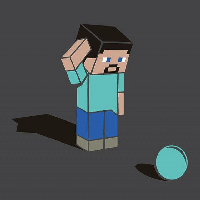 When did you first play Minecraft, how often do you play? - Around the late 1.2.5 period and I play for a good portion of the day. What is your previous experience in any type of moderation? - I've was an administrator on an "The Blockheads" Server, if that counts. How many hours can you contribute per day? (As long as your can log into the server 3 or more times a week for a hour or more) - At the very least, about two hours, mostly on weekends, but for a long time. What advice would you give to someone that has been griefed? How would you help? - If the Griefing was in the wilderness: "I am sorry to hear that your [building] was griefed, I would recommend joining or creating a town to prevent this from happening again " If the Griefing was in a town: "Its a shame that people decide to join towns only to troll and grief, be careful next time on who you invite to the town and perhaps add plots to your buildings. I would help by trying to patch up the thing as best as I can and perhaps give the player a small batch of cookies. Are you able to record? (Or help Promote Server in different ways?) - Not really, I could talk about it on another forum I am on. What skills do you have? We are always looking out for talented users. (Are you an Artist, Builder, Graphic Designer, Programmer etc. If you have any work please submit a link so we can check it out!) - I am an Ok builder, however I do like to draw sometimes. Anything else we should know? - That I'm going on a cruise for eight days tomorrow. My MC username is awesomeo13 and I am glad that you took your time to look at this appeal.